Can the Time Steel sway the world away from the Apple Watch? The $250 Time Steel is a known quantity, right? It's the Pebble Time made from stainless steel and with a bigger, ten day battery and higher price tag. The choice is simple. 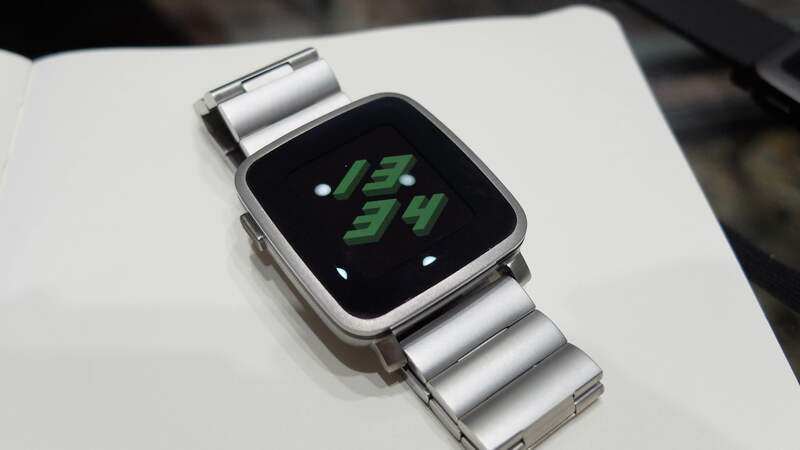 Actually, it's more than that, it's Pebble's attempt to prove it can do mid-range. It isn't just the cheap, nerdy option anymore. There are plenty of reasons why you would want to own this smartwatch over an Apple Watch and it's incidentally still more affordable than the Cupertino wearable. You'll only need to charge it twice a month. It's iOS and Android compatible so you're not tied to one phone. Plump for a steel band and it won't cost you the earth. But how does it fare when you live with it? Is it the pinnacle of smartwatch design? Read on to find out. Putting a Pebble watch on and feeling the weight on your wrist feels a bit odd, especially if you're used to the previous Pebble Steel. It's no bad thing, as it's not combined with a too chunky build but at the same time you end up looking at the Time Steel as a bit of an imposter. There's no mistaking it as a Pebble - the Time Steel is slightly larger and 1mm thicker than the Time making it feel much more dress watch than geek accessory. But it does keep a certain retro vibe thanks to the squircle design, big bezels and of course, video game-style watch faces. It's still more compact than most other smartwatches, though, making it almost by default more of a unisex option. We had a play with the silver, black and gold versions with a classic stainless steel strap plus red and black leather options back at MWC. The gold finish and red strap combination looks a lot like the Apple Watch Edition, just a hell of a lot cheaper. Especially if you're choosing a leather band at the get go, the Time Steel is the better buy over it's plastic brother in terms of pride of ownership. For just $50 more you get a watch that feels more sophisticated to wear. Sure the bezels and an overall lack of delightful, careful finish mean it doesn't look as premium as an Apple Watch. But the textured buttons are nice, the slightly curved body feels solid and well made and, while there's no stitching on the leather bands, it's really quick to swap them out - honest. It's also still water resistant to 50m and we haven't noticed as many scratches on the body during our time with it so far suggesting it's the better option of the two in terms of day to day wear and tear. We were only able to keep our Time Steel review sample for four days so we can't comment on whether the smartwatch will actually last ten days. The official line is 'up to ten days'. That said, the watch dropped 10% (or less) per 24 hours of using it normally, that's with the backlight on the 'high' setting. And it kept this up throughout our testing. All we can say for now is that's better than the regular 'up to 7 day' Pebble Time performs with the same number of alerts. We'll update this review as soon as possible when we get a Time Steel sample back in the office. As for charging, this is lickedy split using the proprietary charger but the accessory is also quite easy to lose. For that reason, we tend to prefer either micro USB or a bedside charging dock. This groan is a valid one but it won't affect you too much - you will only be charging the Time Steel two to three times a month remember versus an Apple Watch which usually requires charging every day. Head over to our Pebble Time review for in-depth details of the new UI, watch faces and apps which are the same across both smartwatches but essentially, this is what you need to know. The colour e-paper screen isn't as bright, sharp or dazzling as Apple Watch and Android Wear rivals - but this is no longer about price, you're making a choice about battery life here. It's generally readable but can be a struggle indoors, for instance - click the left hand button for the backlight if that's set up in settings. It's not touchscreen either but if you just want to skip music tracks when you're walking to the bus, the four textured physical buttons which are better finished than the Pebble Steel's, can be a blessing not an annoyance. The Time Steel, as all other Pebbles before it, does alerts well - reliably with a neat Notifications list so you can scroll back through them, a small thing but missed on some rivals. The animations can take a split second longer than you'd like when moving about the UI but they're fun and mostly forgivable. What Pebble still needs to catch up on is apps - it has fitness covered by Misfit and Jawbone integrations and new big names like Uber but there's still a rookie flavour to its selection of apps. Indie titles and workarounds, like Streble for Strava stats on a watch face, are great and help to give a platform character but if you're paying up to $299 for a smartwatch, you expect a steady stream of new, quality titles from brands you might have heard of. Pebble is still struggling in this respect. Timeline, too, is coming along with some support for the scrolling feed of info nuggets from yesterday, today and tomorrow from the likes of Swarm. But there's still only a handful of Timeline-ready apps and devs have had months to work on them. The fact is that the Apple Watch will have its own version of this feature before long, named Time Travel, and for many devs, building software for the smartwatch with 3.6 million sales makes more sense than building software for the watch with 100,000 known sales. Smartstraps, which will add more tech - a heart rate monitor, say - to the Pebble proposition via modular straps, are also yet to really materialise. Based on our time with it, the Pebble Time Steel deserves to sell more and as the Apple Watch drags wearable tech into the mainstream, Pebble may well scoop up more sales from people looking for a cheaper, longer lasting alternative. The Pebble Time watches have been treated to a few updates since they were announced and that includes a v3.3 update for Android that just went live. Android users get better syncing so if you dismiss a notification on your phone, it will be dismissed on the watch and also the ability to reply to messages that disappear before you have a chance to act, not just read them. Both nice additions. Both iOS and Android also now have relationship bars in between the icons in Timeline - this just means that you can easily see when events in Timeline overlap, happen back to back or have time in between them. It sounds simple but if you're scrolling through your agenda, it's a good, glanceable indication of how your day looks. The Time Steel is everything we’ve come to expect from Pebble - reliable, a bit geeky, easy to use - and more. It’s the best-looking smartwatch Pebble has produced - some of the finish and strap combinations are honestly quite classy, and it’s also the loveliest to wear. The ten day battery life, which looks to be accurate, is also impressive. The slightly washed out, colour e-paper screen won’t be for everyone and the big picture is that we’d prefer not to compromise on display quality. And the apps, accessories and real world partnerships can’t match Apple and Google. But this is a genuine Apple Watch alternative, make no mistake.